"We're floating mate, we're floating," - Ruth O'Keeffe still remembers the moment a crackly voice came through the police radio and she knew they had to turn back. The water was rising rapidly and it was a race against time to get to safety. Ruth was trying to collect her children from their grandparents' house. In the end, it would take her three days. She was the last person across the town's central Phoenix Bridge before it was closed - too treacherous to cross. 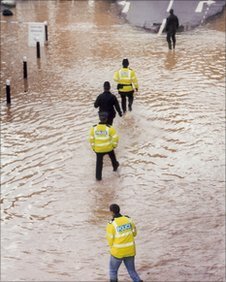 To many people in Lewes, the days of torrential rain in October 2000, which led to 600 homes being evacuated, are often known as simply "the flood". Barrels of beer went floating up the River Ouse, cars were completely submerged and emergency workers were forced to smash their way into people's homes to rescue them from the rising water. 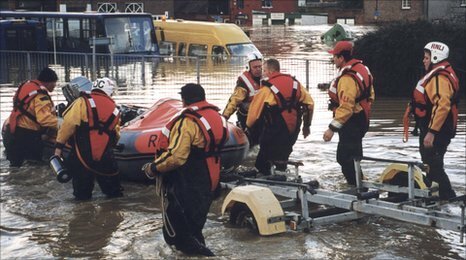 In pictures: The Lewes floods of 2000 - images from local people. Ruth was with her eldest daughter, who was 12 at the time. "My daughter Siobhan and I got in this police van and he started driving," she said. "As he came round the corner into Orchard Road, the ambulance that was ahead of us radioed back - 'We're floating mate, we're floating,' and they sounded really panicky. "Then he said 'Look I'm sorry, if they're floating in the ambulance we can't go down there, we'll have to go back down the hill'. "So we went back down the hill which by now had a puddle at the bottom of it as well. We were standing around and someone went off to rescue the people in the ambulance which was in the most deeply flooded bit and we were standing by the roundabout wondering what to do next." The picture of the floating ambulance later became synonymous with the floods and was even used by the WWF on a poster highlighting climate change. Then things got even more dramatic. "The voice came through on the radio again - the policeman said the water was coming up the Cuilfail Tunnel and we'd have to move fast. We looked down it and you could see this shimmery dark thing coming up the tunnel towards us. "My daughter was 12 at the time, but she remembers it quite clearly. She said as she was running across it was so frightening but she couldn't resist looking down. "You could see the water was almost up to the top of the archway, the pavement and the road. We ran across and didn't realise we were the last people to cross that bridge for quite some time because they said it was unsafe." After that, Ruth's daughter refused to go back to their house and sought higher ground, at the home of a school friend and her parents. Ruth, though, stayed up, watching the water encroach from all directions, and later went to the town hall to hand out blankets and comfort those whose possessions were now floating in a sea of mud. A year on, many people who had been evacuated were still not back home. 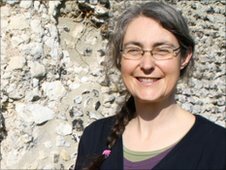 Ruth said: "I think anyone in Lewes who wasn't actually flooded probably felt quite guilty about it, like the survivors of an aeroplane crash. "It leaves a big scar on you forever if you've had to go back to a property where all your belongings are floating round in scummy water, especially for older people who had photo albums, things they couldn't restore digitally or rescue or find again." The town had been hit by flooding in November 1960, although not to the same extent. Since 2000, millions of pounds has been spent on defences by the Environment Agency , but when heavy rain is predicted people still cast a wary eye at the River Ouse. Ruth adds: "The problem is, of course, unless you have a flood defence for absolutely everywhere the water doesn't really respect it, it will go round it. "We are better off than we were and there are quite large bits of the town with what is supposed to be one in 200 year flood protection - but of course every year it's a one in 200 chance - it doesn't mean it'll take 200 years before the town floods again." To mark the anniversary an exhibition has been organised in the town by Artemis Arts . The iconic photos of Harveys , the brewery, with its infamous floating beer barrels, and lifeboat crews paddling down the streets in an inflatable dinghy, are all on display - to "celebrate the courage and resilience of the people who lived though it", says Ruth.